The appearance of Oculto is much like any other typical Mexican-style lager. 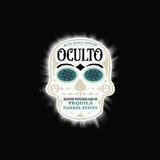 It is vibrantly yellow, and while most Mexican lagers have the appearance of human urine, Oculto is one of the only brands that actually manages to capture that essence within it’s flavor! Much respect to Oculto for bridging that long- explored-but-never-achieved gap.